This book is written in 2009. 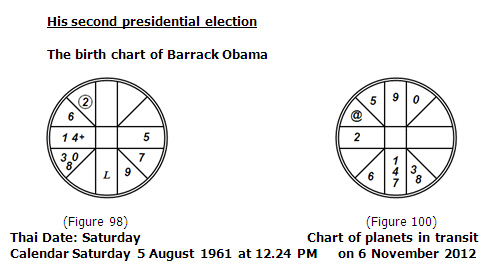 Based on the planet positions that can be calculated in advance, we believe that if the birth time is correct he will be re-elected in 2012. His re-election occurs on 6 November 2012 at the age of 52. Between the ages of 48 and 52, the 1st (Self) House in transit, @, is still in Gemini. In relation to @ in Gemini, the 9th (Exaltation) House is Aquarius. Saturn (7) and Rahu (8) are Co-Rulers of Aquarius, therefore while @ is in Gemini, both planets represent exaltation. In the transit chart, Saturn (7) is in Libra. It is in conjunction with Lagna and also especially strong in Exalted position. The planet that represents honor reaches self. Saturn (7) in transit in the same House as Lagna is also the Special Position for Success for people with Lagna in Libra, a Human sign. In the transit chart, Rahu (8) is also strong in Exalted position in Scorpio. Rahu (8) in transit is also in conjunction with Mars (3) in transit, its Element Pair, making it stronger. While Rahu (8) is in the 2nd (Income) House from Lagna, it also acts as the Leading engine for Lagna; hence it can exert more influence on Lagna than when it is in other Houses. Rahu (8) is another planet that represents exaltation. Mars (3) that is in conjunction with Rahu (8) is especially auspicious. Mars (3) is the Ruler of Aires. In relation to @ in Gemini, Aires is the 11th (Luck) House. Therefore while @ is in Gemini, Mars (3) represents luck. The planet that represents luck reaches the planet that represents exaltation. In the transit chart, both the Sun (1) and Mercury (4) are in Libra, in conjunction with Lagna. The Sun (1) is in the Special Position for Success, and Mercury (4) is in the Special Position of Plenty, for people with Lagna in Libra, a Human sign. We therefore see him winning the second presidential election in 2012.